SPOKANE, Wash. - Monkey see, monkey do, but it's not every day you see a monkey sitting in a chair, unless it's part of the 'Monkey in my Chair' program. 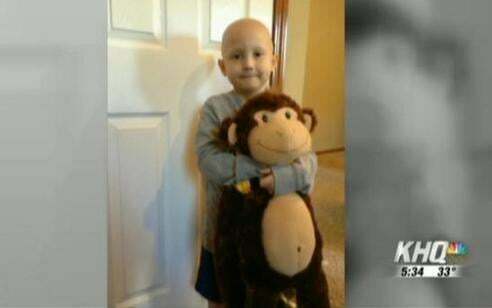 The 'Monkey in my Chair' program sends out 'Monkey Kits' to kids battling cancer. The kit includes one big monkey, one little one, and plenty of journals and handbooks. The bigger monkey sits in the students chair at school while they are undergoing treatment and the little monkey keeps the little patient company in the hospital while they are missing their friends at school. Here in Spokane, Providence Sacred Heart Children's Hospital handed out about 25 of these kits over the past 3 years. One of the recipients is 7-year old Carter Hadlock. In January 2012, Carter was diagnosed with A.L.L. - acute lymphoblastic leukemia - forcing him to miss the beginning of kindergarten. "I was really, really sad he wasn't going to be able to start with all of his friends," explained Carter's mom, Amanda Hadlock. "He was going to miss the social skills that you learn when you first start school." Carter's mom requested a monkey for Carter as soon as she learned about the program. And, to this day, the monkey keeps Carter's seat warm for him whenever he has to miss a day of school to go to the doctor. "Sometimes he's kind of wild," said Carter in describing how his monkey acts at school. "He sits at my desk and does my work for me...he learns math, and he learns stuff like numbers." Carter's older sister, Brooklyn, is in charge of the monkey when Carter has to go to the doctor, but she doesn't mind the extra responsibility. "I bring him back and forth from home and I got quite a bit of attention on the bus, like woah, what's that monkey for?" explained Brooklyn. "It brings a lot of attention but I think it's kind of funny walking around with a big monkey around the school...I'm really glad to help him[Carter] out." Because the monkey has had a steady presence at Carter's school over the past year, his classmates now have a better understanding about what Carter and his family are going through. "When he [Carter] returned to class, they didn't look at him like, who's this strange bald kid coming in," said Amanda. "They were so excited to see him, they were so used to having the monkey there, and knew all about Carter and knew what to expect when Carter came." "[This program] gives them something to say when sometimes words are really hard, when it's really hard to explain what cancer is, what the family is going thru," explains Rowe. "It gives people some kind of an idea, that that kid and the family is going thru something. It just improves empathy across the board with children, and really gets the child embraced by their school community." Carter is still receiving chemotherapy about once a month but his cancer is in now in remission. Hopefully very soon his monkey will have a permanent seat next to him, instead of in place of him, at school. For more information about the 'Monkey in my Chair' program, check out their website: http://www.monkeyinmychair.org/.